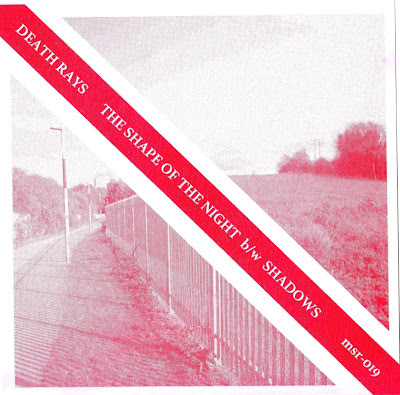 Death Rays debut 7" The Shape Of The Night b/w Shadows. Death Rays are formed by two like-minded souls from the small market town of Bury St Edmunds in Suffolk UK, these two suburban outsiders go by the names Alexander Hawthorne & Simon Nunn. Death Rays as a musical project was birthed as a revolt against the ever frustrating boredom of small town UK and Market Square are super proud to be releasing this their great brand-new debut 7". Their debut focused around two tracks written & recorded by the pair via Hawthorne's home studio Am Krogel in Berlin Germany. Side One, The Shape Of The Night starts with ambient crowd noise which gives way to the intense pounding of a vintage 70s drum machine, enveloped synth sounds and guitar feedback, sounding like a weird mixture of Suicide, early Sisters of Mercy & Les Rallies Denudes. Hawthorne begins singing in a Mary-Chain-esque manner about the woes of life, the highs, the lows, the subject matter open to interpretation, the music building to a feeling of intense agitation and creating to my ears one of the best new drone pop moments in music today. This is neo-psychedelic music which "means" it, it is minimalistic, intense and angst ridden. The B-side is a more softer affair featuring the track Shadows, the track has a very Spiritualized feel to it, with tremolo guitars, fluttering synthesisers and softly spoken vocals. I feel this Death Rays 45 is a super new release and far outshines many of its contemporaries in the neo-psych "scene". To add to its charm the 45 has been mastered by Sonic Boom who needs no introduction. Limited to 300 copies only housed in hand-numbered risograph fold-over sleeve includes a lyric insert and Market Square post-card.